Off for the holidays? We are off to Texas to visit family and then going skiing. BRRR. But looking forward to a much needed break, and the kids are excited to play in snow, since it seems we have skipped winter in NY so far. No snow as of yet, and last year I think we already had snow in Thanksgiving. But HEY! we had our share of snow and frigid temps last year that has left me traumatized! So not complaining if we have a dry winter this year. We're packed and ready to go. I pulled an all nighter packing! LITERALLY. Packing for myself, two kids, a dog and for two totally different climates was rough. HA. But I did it! Even though around 4am I was about to throw the towel in and give up. Somehow you stress over it, but you always manage to get it done somehow, some way, right? Well I feel very accomplished now, even though I desperately need to get on that plane and ZZZzzzzzzzz. It's a wrap for 2015! From mine to yours we wish you a HAPPY HOLIDAYS, safe travels, and hope you carve some time out to make some last memories for the year. See you back here in the New Year…2016! That felt so weird to write that!! HA. Whether we like it or not, it's happening. Embrace it. Be right back in the New Year…January 4, 2016 to be exact! 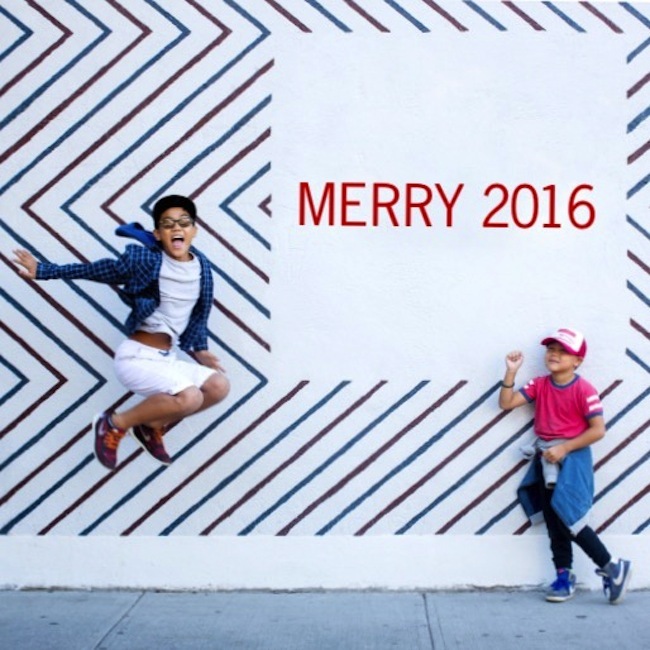 MERRY 2016.